Looking for creative ways to avoid the summer slide? Summer break is an excellent time for your child to take a break from their daily routine of learning, but in that, they can experience a summer learning slump. A summer learning slump or summer slide; however you choose to say, it means that your child is losing what they learned in school. That during the summer break, they are not using the skills they have been taught through the year, so the chance of losing what they retained during the school year could, and often does, happen. This summer learning loss can set children back upon entering the new school year and often carries through the year with them. These below workbooks are a fantastic resource to use at home throughout the summer months! They are available for every grade level and at an affordable price! There are many ways you can prevent the summer learning slump. With activities, you do at home, or enrolling your child into a summer learning program or other activities outside of the home to help nurture their minds. Let me share a handful of ways that you can effectively avoid the summer slide and keep your child on track for learning and growing. The New York Times wrote an article on how children can lose valuable skills they learned throughout the year, in the summer months. They have said a child could lose an entire months worth of learning in math and reading skills during the summer. For lower-income families, a child has the chance to lose around two months of learning. This is why the prevention of the summer slide is so vital to parents, children, and teachers. During the summer when the child stops working their brain in areas that they are getting trained in at school, they can forget what they were being taught in a sense. Lazy days or even days at the pool or in front of a TV screen can break down your child over time. Having activities to keep them stimulated and learning is vital! 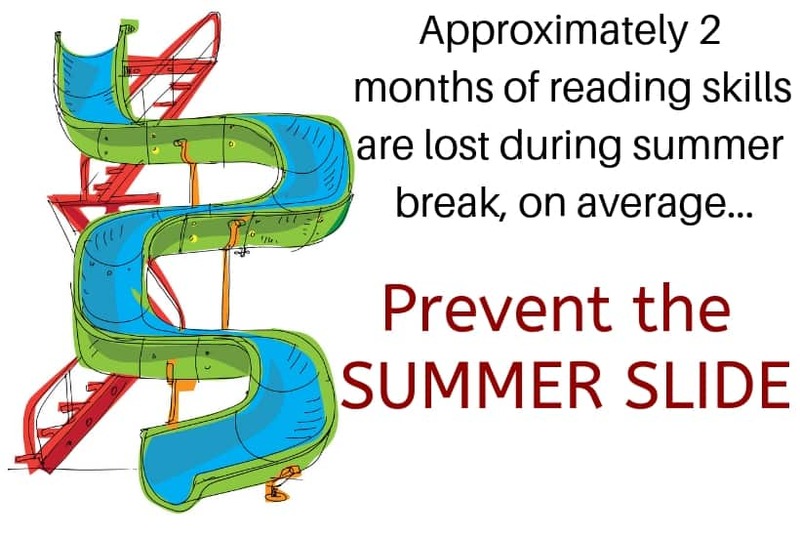 This will keep their minds sharp and help to prevent the summer slide from occurring. Take the time each day to spend thirty minutes out of your day with your child reading. Whether you are reading to them, or they are working on reading out loud to you. Books are a great way to help keep your child’s mind to stay nice and sharp, build vocabulary skills, and more. Or you can opt to find a reading program in your area to enroll your child in over the summer. Whether it be a program your library hosts or something connected with your school. Whichever route you choose, ensuring that reading is a part of the summer break is key. We use AUDIBLE and love having audio-books to listen to at home or in the car! Sign-up for a free trial with this link and get 2 FREE audiobooks! Make sure that in everyday moments in your life you take it as a learning experience. Let your child help at the store by counting out how many apples you need, or reading nutritional labels. Maybe you’re cooking in the kitchen, let them read the instructions or help measure ingredients. You will find all around your home; there are ways to incorporate learning in a fun way that doesn’t feel like they are in the classroom. Teach them how to do laundry and measure right, setting the timer for the dryer, and the list goes on. These small things make a big impact in avoiding the summer slide in your children. Take a trip to your local museum and learn a bit of history for a day. Or head out to an art museum or even the zoo. You can help teach your child with hands-on activities, so they can stimulate their minds. Talk about what the tiger eats, or what the child sees when they look at the painting on the wall. You don’t have to be a teacher or be technical at all. Just work at helping your child see things that surround them and learn from experiences. Take time to find some crafts or science experiments your child might enjoy. Maybe learn how to make a volcano that erupts. Teach them why the baking soda and vinegar created the foaming effect. Or let them work on their scissor skills in making a paper plate craft. Both of these activities are fun for kids, and they won’t even realize they are learning and keeping their minds sharp as they play. Check out our post on having an organized summer with kids for plenty of great ideas! Make sure that playtime during the day has a purpose. Give your child options as to what they can play, instead of grabbing the controller for their video games. Sit down and say 30 minutes of building with LEGOs or imaginative play. Then when the time is up, give them a few more options, like an outdoor play or working in the garden with you. Just try to ensure that whatever activities your child is doing helps them grow. Of course, it is okay for them to play on their tablet, but make sure you limit screen time. The best way to prevent a stall in learning or a slide in education is to keep children engaged in activities that promote growth and literacy. Utilizing STEM toys like the one below are a fantastic option for teaching without your kids feeling like they’re being taught! Use play as a means for education wherever possible! Let your child start writing in a journal. They can work on expressing themselves without even knowing they are learning and growing. When preventing the summer slide, we don’t have to go above and beyond to tell our kids that they are doing “school work”, simply incorporate education! They can talk about what they did the day before, or what is on the agenda for the week. The journal writing should be fun and encouraging. If they are struggling with what to write, you can find tons of writing prompts online to help give them ideas of what to write on. The most important thing is just making sure your child stays engaged in activities around them. Take the time to work with them on arts and crafts, sit down and read a book with them. Go on a trip and learn about dinosaurs for the day, make the summer fun. They don’t have to know there is learning involved, but you can rest more soundly knowing you are working and doing your part to make them stay ahead and ready for the next school year. What ways do you help avoid the summer slump in your house?